Add a new sales channel to your website. You wouldn't run a real shop without anyone at the counter. So why run your website this way? Be there for every visitor, with Live Chat. Answer questions and give assistance to convert more visitors into customers. Super simple integration. Cancel any time. People visit your website every day and struggle to find what they need. If you're not present, they're likely to leave and never come back. Messaging with your visitors and customers is faster, easier, and more natural than speaking over email. You might as well build a wall between you and your customers, if you still force people to email you or jump on the phone. GoSquared Live Chat in 1m 38s. Collaborate to capture leads and convert visitors into customers. Everything in GoSquared is real-time – every number, every graph, and now every message and customer. Because of the powerful analytics engine under-the-hood, you'll see every action that led up to the conversation. GoSquared automatically looks up social and company information, so you can see exactly who you're speaking with. Whether working independently or as a team, GoSquared Inbox makes it easy to see who's dealing with what, and which customer need urgent attention. Why did you give Jessica a refund in February? Add a note to any conversation to ensure you never forget, and to help your team collaborate more effectively. GoSquared Inbox is tightly integrated with the Customer Data Hub. You'll always have the key information you need to help customers quickly and personally. Automatically translate messages between your leads and your team so you can speak any language fluently. Save your team time, answers questions consistently, and get back to leads faster with Saved Replies. Effortlessly send a downloadable transcript of your live chat conversation in a few clicks. GoSquared intelligently stitches sessions together to show a unified profile for every customer – from their very first visit. The possibilities are endless when you connect GoSquared to Zapier. See what you can do on our Zapier page. Connect GoSquared with Slack to receive notifications every time your visitors and customers message you. A friendly, modern messaging experience for visitors and leads. Most live chat tools ask visitors to fill in fields before they can start a conversation. GoSquared cuts out the barriers and only asks for key details when it suits the visitor. 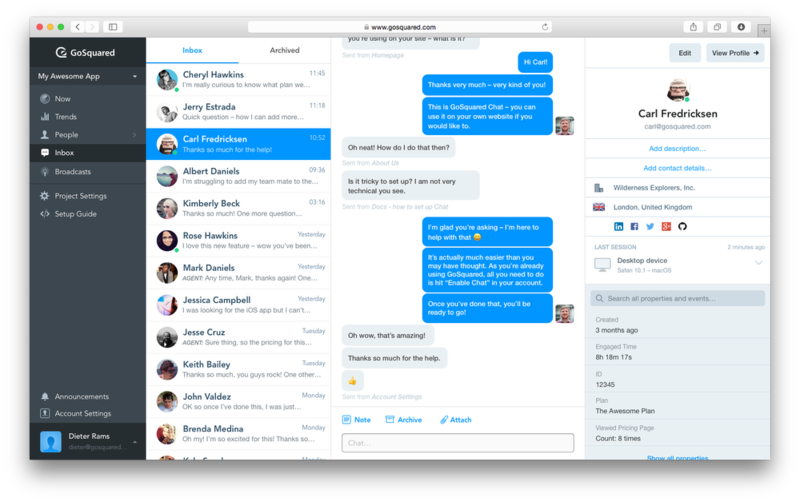 We've designed GoSquared Live Chat to look and feel great for your visitors. We're always improving the experience too – so it gets better every day. Want feedback on your pricing page? Want to understand if people have any questions about your new landing page? 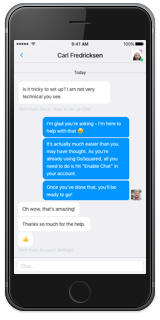 Set up tailored Chat Prompts to engage visitors, capture leads, and win customers. Install on your website in minutes. Include the GoSquared iOS SDK in your apps for beautiful, native, real-time instant messaging with your users. Get the iOS SDK on GitHub. If you want to trigger Live Chat off your own interface elements, and customise specific functions, you can do with a growing array of customisation options.